At President Barack Obama's second White House Astronomy Night, which took place Oct. 19, the president encouraged an audience of young people and educators to explore science topics. The attendees were allowed to wander the White House's South Lawn, where there were telescopes and space-based activities. WASHINGTON -- Last night on the White House's chilly South Lawn, under a vividly glowing crescent moon, future scientists and astronaut-hopefuls gathered to learn and celebrate the science of the stars — and across the country more than 80 other sites joined in with their own stargazing events. The second White House Astronomy Night (Oct. 19) welcomed students, teachers and other visitors to an evening of stargazing and science activities. 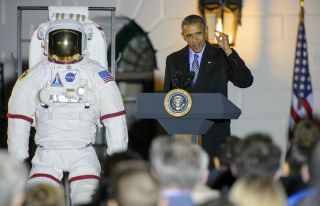 The event featured NASA astronauts, science celebrities and President Barack Obama. The event played host to a lot of big names: 12 NASA astronauts, science popularizer Bill Nye the Science Guy, the hosts of the TV show "Mythbusters," multiple members of Congress —including former astronaut and U.S. Sen. Bill Nelson (D-FL) — and more. But the real special guests were the young people selected for their interest and excellence in the STEM (science, technology, engineering and math) fields. Included in the audience was Ahmed Mohamed, the Texas high schooler who was recently arrested (in a NASA T-shirt) for bringing a homemade clock to school, which teachers mistook for a bomb. A group of middle school and high school students from Russellville City Schools in Alabama were also in attendance. Agatha Sofia Alvarez-Bareiro, a 12th-grader from New York, showed President Barack Obama the different parts of a telescope before inviting him to use it to examine the moon, at the second White House Astronomy Night on Oct. 19. The first speaker to join Obama on stage after his opening statement was Agatha Sofia Alvarez-Bareiro, a high school senior from Brooklyn, New York, who explained the parts of a reflector telescope to the audience, before inviting Obama to take a look through the lens. She then pointed out the lunar maria, the moon's dark patches. Later on, other attendees also had the opportunity to view the moon through the telescope. John Grunsfeld, NASA associate administrator for the Science Mission Directorate, showed off a spacesuit glove at one of the White House Astronomy Night science activity stations on Oct. 19. Attendees were then separated into groups and invited to view the sky from an array of telescopes, or interact with several science exhibits scattered across the South Lawn, including a mini-planetarium from the Lunar Planetary Institute. There was also a groupwide conversation with "MythBusters" hosts Jamie Hyneman and Adam Savage and a panel discussion featuring four NASA astronauts. Meanwhile, national parks, observatories, schools, museums and astronomy clubs around the country and beyond hosted their own astronomy events — including one at a school on a NATO base in Europe. These participants were able to download a kit that included a poster, Mars habitat building project instructions and space-fact trading cards. (l to r) Astronauts Sunita Williams, Eric Boe, Robert Behnken and Douglas Hurley were featured in a panel discussion at the White House Astronomy Night Oct. 19. The panel was moderated by Cristin Dorgelo, chief of staff for the White House Office of Science and Technology Policy (far right). The astronauts described their training and answered audience questions. The science stations on the White House lawn educated attendees about diverse areas related to space science, such as spectroscopy, using the stars for navigation on Earth, and a virtual reality simulation of what it would be like to walk on Mars.. They also learned about the upcoming James Webb Space Telescope, the CST-100 Starliner Boeing is developing to bring seven NASA astronauts to the International Space Station at a time, the VEGGIE project to grow fresh food in space (the project's first lettuce was just recently eaten aboard the space station) and SpaceX's 3D-printed SuperDraco thruster. Meteorites were on display during the second White House Astronomy Night on Oct. 19, 2015. Plus, visitors got to touch asteroid samples and a moon rock collected in 1972, build their own small satellites, and learn about programming Sphero, an app-controlled spherical robot whose creators are working on sun-orbiting robots — they also created the adorable "Star Wars"BB-8 replica robots. Some of the telescopes scattered on the White House lawn for Astronomy Night. Obama used the event to highlight several new private initiatives to bring science to the public, including eight observatories in Hawaii opening their doors for free guided tours. He also lauded NASA's goal to put humans on Mars in the 2030s. "We need teachers to light a spark of curiosity in young minds, and we've got some outstanding teachers here today," Obama said to the attendees. "We need parents to leave encyclopedias of famous scientists lying around the house, or help turn a bedroom into an ideas laboratory. We need to inspire more young people to ask about the stars and begin that lifetime quest to become the next great scientist, or inventor, or engineer, or astronaut. We have to watch for and cultivate and encourage those glimmers of curiosity and possibility, not suppress them, not squelch them, because not only are the young people's futures at stake, but our own is at stake." And under the cool night sky, with those young people eagerly meeting scientists and astronauts and taking in the stars, it seemed like they were up to the challenge.